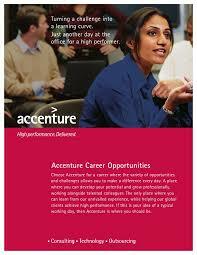 A large number of options are open up to Accenture consultant who want to leave the firm. First, in this type of large organization — remember that Accenture has more than 260,000 employees across the globe — there are many internal opportunities so that leaving your local Accenture office does not necessarily mean getting out of the entire global organization. Industrial careers and other consulting firms are also open for the next job after Accenture. If you have integrated this firm as a junior, and you want to continue your route through a complementary training like an MBA, all doors are open. Note that Accenture has implemented a recruitment team dedicated exclusively to the alumni, which demonstrates the interest of the firm for the recruitment of alumni and in investing long term in its employees. This practice is not frequent in the consulting sector and worthy of note. In general, good practice is to do everything to leave one’s former employer on good terms, but in the case of Accenture being able to be recruited a few years later as a former employee strengthens the interests of the thing! Accenture is a very large company in which relationships between employees are more impersonal than in small firms. The culture there is also less strong. For example, some consultants claim not to have the feeling of belonging to a family, as is the case with BCG, for example. Beyond the work, it is rare that Accenture consultants spend a lot of time together. If a drink after a day’s work has nothing extraordinary at BCG or Bain, it is much rarer at Accenture. The profile of Accenture consultant is very traditional in comparison to other firms. Accenture consultants are ambitious, balanced, and open. A typical experience at Accenture translates to long working hours, extensive travel — typically four days within a week — and, as in most of the firms of this level, some stress on a daily basis. Finally, the nature of the assignments, which are very oriented towards performance and process, gives rise to consultants who have attention to details, who like modeling processes, procedures, but who are not often confronted with the big picture of their client. This feature explains that some recruiters do not consider Accenture as an experience of value, then, towards strategy consulting. I personally do not share this point of view, several successful Accenture consultants being now partners in top-tier firms in Europe.